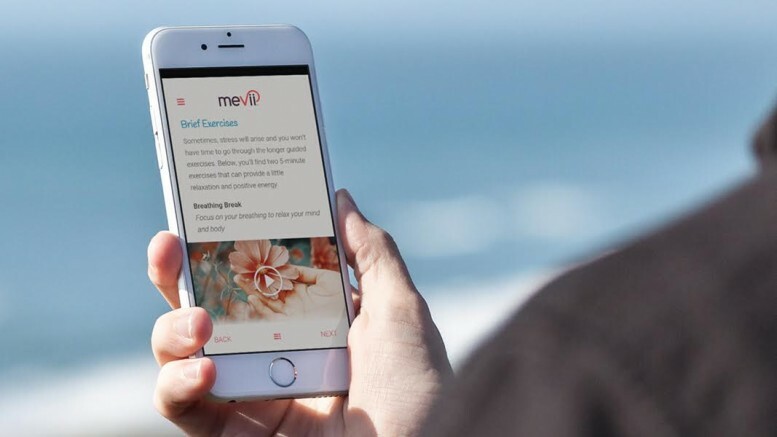 The maker of MeviiTM, a mobile application originally created to help promote well-being by managing stress, has announced a massive relaunch of its mobile app to address those suffering feelings of anxiety and mild depression. The self-help application uses evidence-based strategies grounded in cognitive behavioral therapy to help its users manage emotions, solve problems and strengthen relationships while developing mindfulness. Co-Founded by Kelly Earp, PhD, MA, Thrive 4-7 LLC created Mevii to help change behaviors and build coping skills literally in the palm of your hand. Mevii utilizes video guidance, interactive activities, and relaxation exercises as well as a prototype tool of ‘Ask Mevii’ chat functionality powered by IBM Watson. With its relaunch of Mevii, Thrive 4-7 LLC is also announcing partnership solutions for enterprise customers who want their employees or groups to have access to Mevii. In enterprise solutions, Thrive 4-7 would provide tools for onboarding employees in using Mevii, provide employers with aggregate and de-identified data on usage, and pre- and post-program self-reported outcomes. Individuals can download Mevii from both the App Store & Google Play for $9.99 per month. Learn more at https://www.mevii.com/.